Suffering from depression and anxiety can make you feel helpless. The truth is you're not. And, no - therapy along with medication that leaves you feeling drowsy isn't your only option to fight back. In fact, there are many herbs that help ease depression and anxiety minus the side effects associated with antidepressants. Give them and a try and start feeling better right now! One of my favourite herbs for anxiety, stress and insomnia, passionflowers has been shown to work as well as some anxiety medications. How amazing? If you suffer from severe anxiety or often find yourself feeling unnecessarily stressed, give this one a try. Sluggish? Anxious? Stressed? Or all three? Ashwagandha naturally lowers the stress hormone, cortisol, providing anti-anxiety relief similar to that of lorazepam. It’s lovely in a tincture or tea form daily, and an added benefit is that it’s a proven cancer-fighter. Are you walking around with a heart that's ageing faster than your body? If your heart is older than your chronological age, you could be at risk of a heart attack or stroke. But fear not, your heart isn’t doomed to early retirement. Because this one nutrient your body doesn’t produce could help turn back the clock of your ageing heart. An anti-anxiety warrior of note, lavender is great in your tea, bath or skincare routine. However, I also use this herb for aromatherapy. Simple put eight to ten drops on your pillow before bedtime for a long, restful sleep. Or, boil a pot of water, add organic lavender essential oil, and inhale deeply for an incredible at-home spa ritual. Chamomile is great for soothing aches and pains, as well as for boosting your immunity. However, one of its other very popular uses is for osteoporosis. 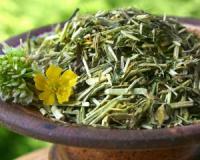 The herb goes straight to your bones and stimulates osteo-based cells, lubricates your joints and reduces inflammation. Rhodiola is great for increasing energy, relieving stress and enhancing memory. It seems to enhance the transportation of important serotonin precursors in your brain, and is a potent adaptogen, meaning it normalises the functions of your body. Furthermore, it’s also a known cancer-fighter. In addition to using herbs to treat your depression and anxiety, you should also change your behaviour – for example, your lifestyle, way of thinking and physical activity levels – for optimal results.